Two of our guests-turned-friends, Travis and Nicole, were at the Inn this chilly January week and we took an afternoon to hike up together to Heartbreak Ridge in Old Fort. 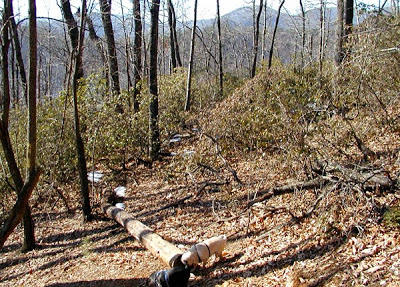 The trailhead for Heartbreak Ridge Trail begins about two miles northeast of the Inn on Mill Creek. 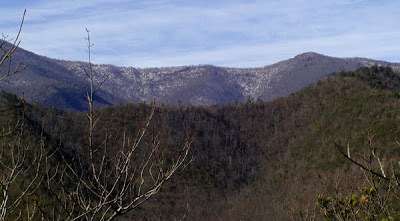 The north end of the ridge leads up several miles to the Blue Ridge Parkway and is part of the Off Road Assault on Mt. 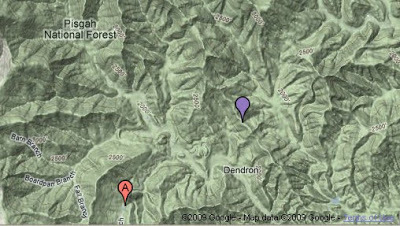 Mitchell mountain biking race each July. The racers have serious endurance. 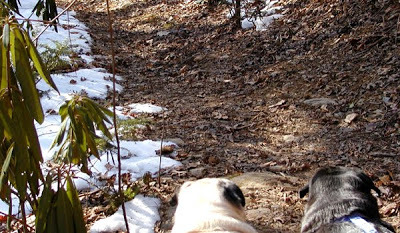 Our innpugs, Csaba and Bugsy, have pug levels of endurance, so we made a simple two-mile roundtrip trek up to the ridge and back. 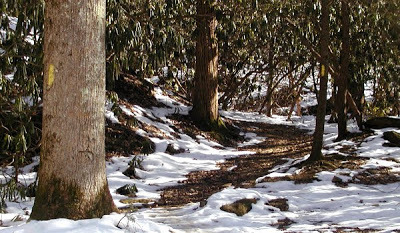 What a great winter hike, even with snow on the ground! The first part of the trail is relatively flat and curves through a valley and across a small stream, which appears to be part of Pritchard Creek The trail then veers to the right (just watch for the yellow blaze marks on the trees like in the photo below) and turns into a switchback trail up the west side of Heartbreak Ridge. Enjoy those unobstructed views! Don’t forget your camera. 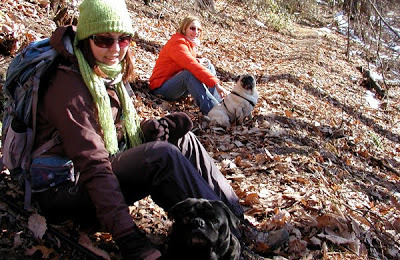 This entry was posted in Uncategorized and tagged guests, hiking, outdoors, Winter by Inn on Mill Creek. Bookmark the permalink.